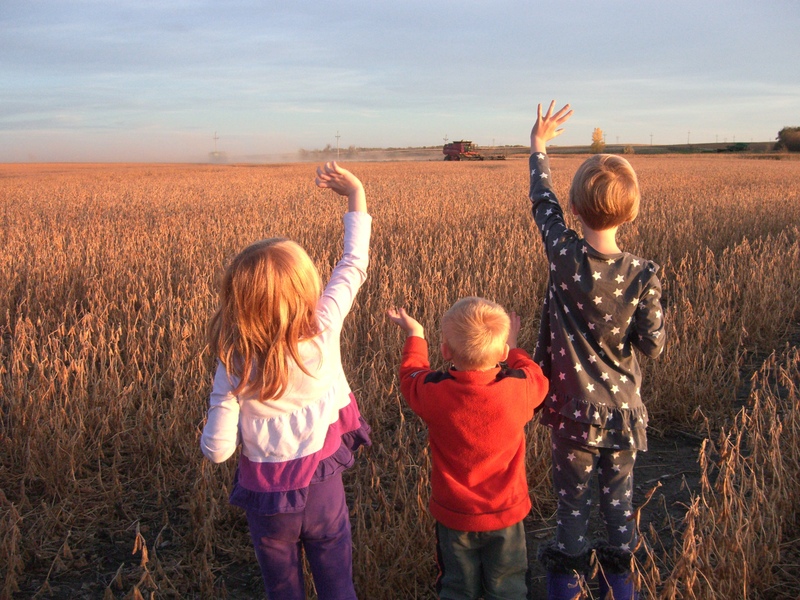 During harvest season on our family farm in Jamestown, North Dakota, my husband, Jeremy, and I split the family and farming duties among us, along with our two full-time employees Casey and Tony. He is the general manager of the farm and is usually in one of the combines. Sometimes, we also have interns who help. My role is focused on the household, homeschooling our three children, and preparing the meals for our teams out in the soybean fields. In the afternoons and evenings, I go get whatever they need to keep harvest going. I help move equipment, I run for parts and fuel and occasionally I help run equipment. Together, we are part of the 97 percent of U.S. farms that are family owned, and we take great pride in participating in this family farm tradition. On our farm, all of our workers are considered family as well. We harvest soybeans first each year, followed by corn, which are both used primarily as feed for poultry and hogs across the world. For example, one time we had a broken part and our local parts supplier didn’t have a replacement. My husband had to drive three hours, at midnight, to the closest replacement part. We are very aware of how we’re always running tired during harvest, and we make absolutely certain to make safety our top priority. We emphasize caution and communication among workers, and we look out for one another during the long days. One thing that has a major impact on harvest is weather. We are completely at the mercy of weather conditions. Most of the time, any amount of rain shuts us down completely. Because we farm land that isn’t all connected, we can sometimes just move our equipment to another area for harvest if a different part experiences different weather conditions and crop maturity rates. Even though it may not be ideal, we sometimes realize that a rainy day means a welcome break, and we appreciate the chance to rest and reboot for the next day’s work. When it’s all over, we take a deep breath and get ready to do it again next year. Friday Night Lights Apples to Oranges: Why Crops Thr... Farming at the Mercy of Mother N... Why Are Farming Moms Thankful?